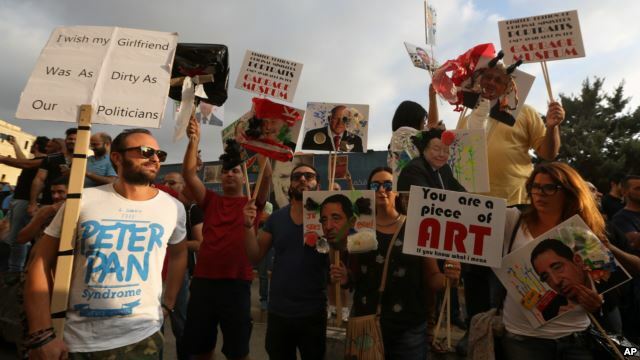 Police fired teargas and rubber bullets into surging crowds in the heart of Beirut Saturday as protests sparked by the country’s garbage crisis became a cry of anger at the country’s political elites. 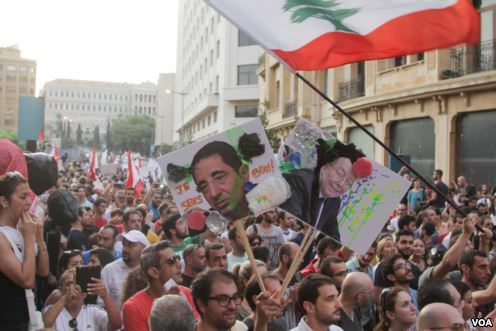 Thousands gathered within view of government buildings during an evening demonstration organized by the grassroots You Reek campaign. 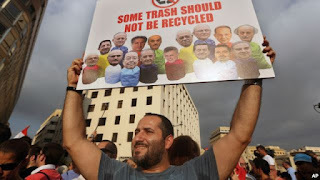 The protest was organized in response to the government's failure to dispose of the country’s trash. But for many it was a chance to voice broader disapproval of the government, with “revolution, revolution” among the chants ringing through the crowds. And as darkness descended on the city, an initially peaceful and upbeat protest devolved into skirmishes and violence. “I decided to come to this protest because for once we are speaking about social rights, about minimum standards of living,” said 22-year-old Yara Safadi. Safadi, who works in film production, told VOA she had been tear-gassed and sprayed by a water cannon. There were many others like her. Following the demonstration, the state prosecutor ordered an investigation into the violence, in which there were conflicting reports over whether live ammunition was also used. 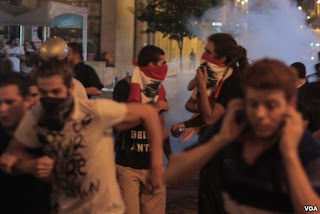 Clashes erupted as the protest, which was blocked by riot police from taking place outside parliament, spilled into Beirut’s central Martyrs Square and the city's prosperous downtown district. 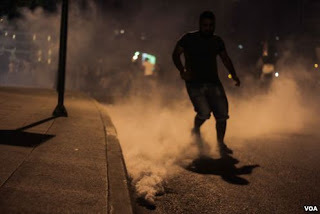 Reports indicate that at least 75 protesters were wounded, one critically, in the violence which saw some demonstrators hurling debris back at the security forces. National TV station LBC has claimed that police attacked one of its crew. Meanwhile, police have claimed that 35 of its members were wounded, though some have questioned the figure. Lebanese Red Cross spokesman George Kattaneh told The Associated Press he expected the number of injured to rise as protests continued into the night. The demonstrations were partly inspired by the state response to a smaller protest over the garbage crisis on Wednesday, in which a water cannon was also used. A number of the You Reek protest organizers were arrested in that protest and one was injured, prompting a call from Human Rights Watch for an investigation. “This is the second time we protest and they fire,” said Marc Daw, an activist. “I think it is politically motivated. We’re causing them serious embarrassment because today was not just about garbage, it was about politicians violating their own laws day in and day out. 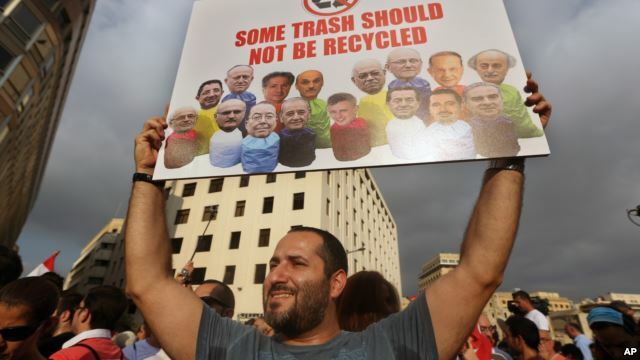 Propelled by social media, the You Reek movement was formed in response to the piling up of garbage along the streets of Beirut and surrounding districts. Since closing an over-capacity landfill, the government has been unable to find an alternative way of disposing of the trash. The piles of garbage were largely removed from sight in the capital in recent weeks, but anger grew when it emerged that much of the trash was simply being dumped elsewhere in the country. Moves to award a new waste management contract have been pushed back from last Wednesday to the coming week. Many of those thronging the streets Saturday called for Environment Minister Mohammad Machnouk to step down, a sentiment echoed by influential politician Walid Jumblatt. Local media report that You Reek organizers have announced an open-ended sit-in demanding cabinet resignations and new parliamentary elections. Speaking to VOA before the protest began, Assad Thebian, one of the organizers behind You Reek, called for a longer term, more environmentally focused approach to the issue of waste management. Political deadlock has left Lebanon without a president for more than a year, while in November members of parliament voted to extend their terms in office by two and a half years. Political analyst Sami Nader says the importance of the You Reek movement should not be underestimated. He says the movement's power lies in the fact that it is the first in a decade that is not about politics or ideology.